The leading cause of global climate change is the emissions of greenhouse gases (GHGs) by humans. This includes the CO2 emissions from factories and cars, the methane released as a result of animal agriculture and landfills, and nitrous oxide from fertilizers. A lot of these things can’t be changed by the average person, but one thing that people are responsible for is their transportation. However, transportation is still a leading cause of pollution because it's hard for people to understand how their individual actions affect the environment, and it can also be hard to start taking steps in the right direction. I decided to create an app that would help people start to understand how they can affect the environment through their means of transportation, and steps they can take to help. The app uses your phone's GPS and motion tracking technology to detect how you're getting around, and calculates how that affects your surrounding environment. The app also uses information from carpooling apps on your phone (such as Uber or Lyft) to determine if you were travelling through a carpooling service. Based on how green your transportation methods are, the app will reward you points. Getting points will earn you small rewards like badges and higher levels, and you can connect with your friends to compete with them. Because the app doesn't require a lot of the manual input of information, it's a simple and convenient way for people to be able to check in on how they're affecting the environment in a fun and social way. It allows you to see how often you use each mode of transportation which helps you make more environmentally conscious decisions about how to get places. Before creating the app, I created two user personas with different lifestyles and personalities to better understand who I was designing for. These personas were based on people that I had interviewed beforehand. 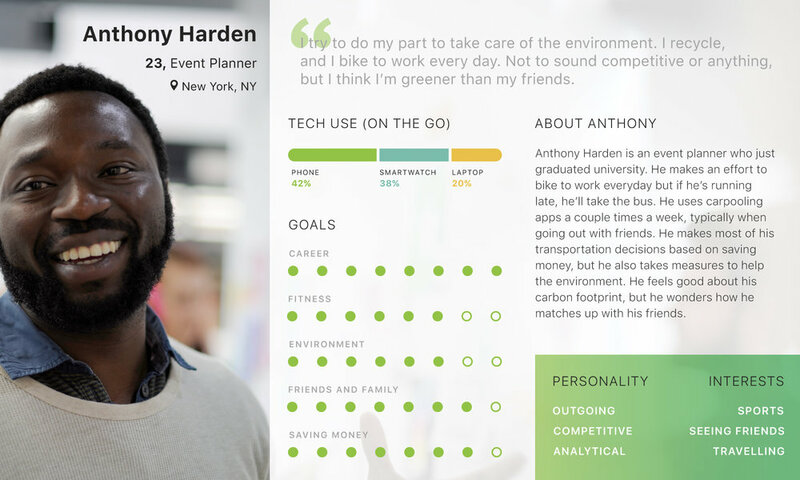 Anthony Harden is an event planner who tries to make environmentally conscious decisions whenever he can, and Jamie Carmelo is a software developer who cares about the environment, but isn't yet motivated to change her lifestyle. The first thing I did before starting on wireframes was brainstorm the layout and features of the app. Then I ideated how each page would look, before figuring out the user flow. I wanted the app to have vibrant colours offset by a clean and minimalistic background and layout. There is a clear colour palette and the app delivers most of its information through data visualizations. Each mode of transportation has an assigned colour that corresponds with how good it is for the environment. The quantifier I decided to use was GHG emissions. GREEN: 0 GHG emissions/km. Walking, cycling, jogging, etc. TEAL: less than 100g GHG emissions/km. This includes most public transit: Busses, subway, streetcar. YELLOW and RED: Yellow and red indicate travelling in a vehicle that emits more than 100g of GHG/km. This typically means travelling in a car, but since carpooling has less harsh effects on the environment it's assigned yellow instead of red. Due to the time constraints of this project, I wasn’t able to conduct a lot of primary research other than talking to peers in my personal network. If I were able to revisit this project with more time, I would do some more in-depth and comprehensive interviews with the people outside of my network that I would be designing for. In addition to this, I would have conducted more usability testing to gain more insight on things I could improve or add to the experience. If I were to continue with this project, I would explore implementing this solution in different interfaces that could be better incorporated into peoples’ lives, such as wearable technology. Since this solution is focussed on peoples’ movement throughout the day, I feel like designing for wearable technology is a more intuitive way for people to incorporate Green App into their daily lives.